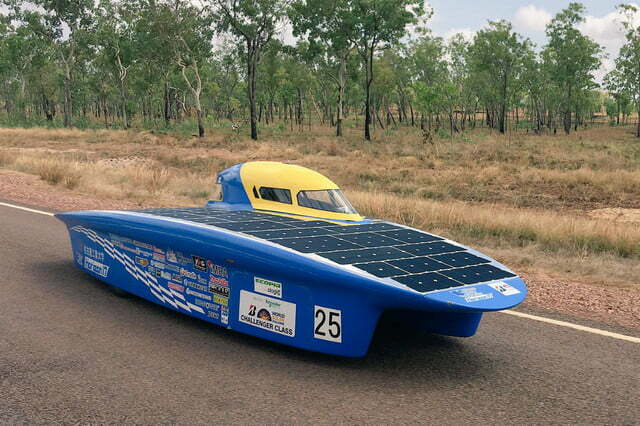 Engineering teams from around the world recently gathered at Australia’s biannual World Solar Challenge to compete in a race from Darwin to Adelaide in cars powered by the sun. This year marks the 30th anniversary of the event and with it came some notable challenges and developments. With 42 competing cars from 40 countries, this most recent World Solar Challenge featured an array of unique designs. This year also provided challengers with tougher standards for their racers by requiring a smaller solar collection area. The cars themselves are unlike most vehicles you’d ever see on a race track. Most cars feature a tiny space for the driver and a large flat surface designed to collect the maximum amount of solar energy, while maintaining an aerodynamic form. As each entry must be powered by solar energy alone, design is key to speed—and racers are able to reach over 60 MPH along the 1,860 mile track running through the Australian outback. Being first to cross the finish line is not the only goal of the challengers; the race is as much about research and development in sustainable vehicle design and technology. The Challenger class puts speed to the test, while the Cruiser category is devoted to transportation practicality, and the Adventure class is all about exploring submissions that offer merit regardless of speed and design. The U.S.’s own submission from Stanford University has been designed with a focus on reliability and safe handling over speed. Many eyes are on the Dutch Nuon Solar Team’s Nuna9 car, which has been modified to a new level of aerodynamics. Currently, the time to beat belongs to the Tokai University team from Japan which made the more than 1,800 mile journey in 29 hours and 49 minutes. What are your thoughts on this competition and the solar power developments that could come out of it? Comment and tell us what you think.